Please make this block in November to bring to the December meeting. We will be using warm fall colors for this block. Please use two different fabrics that contrast each other. You will cut the same pieces from both of your fabrics. 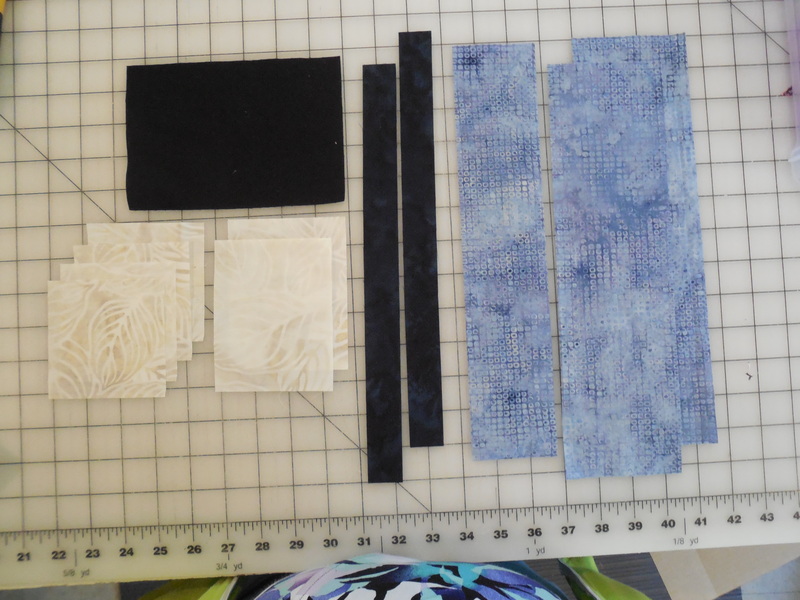 Out of each fabric cut four 3 7/8″ squares. 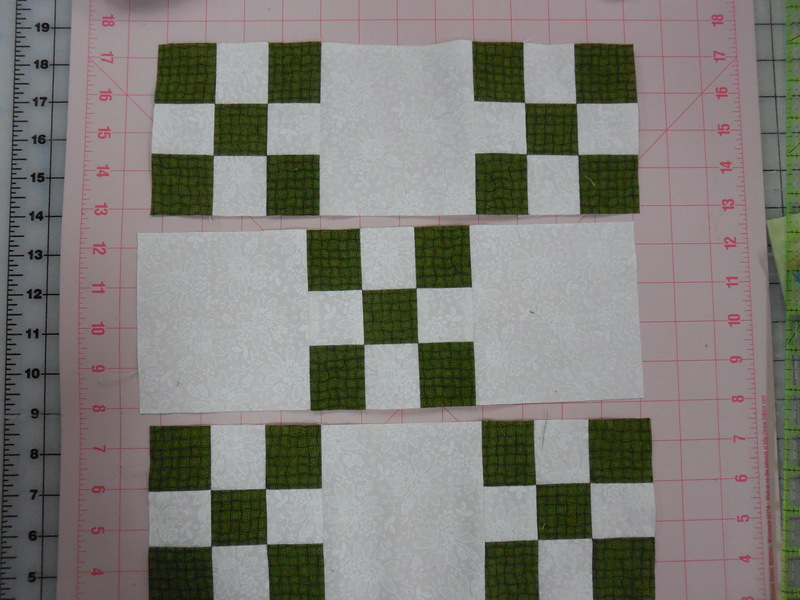 Cut each of these diagonally. 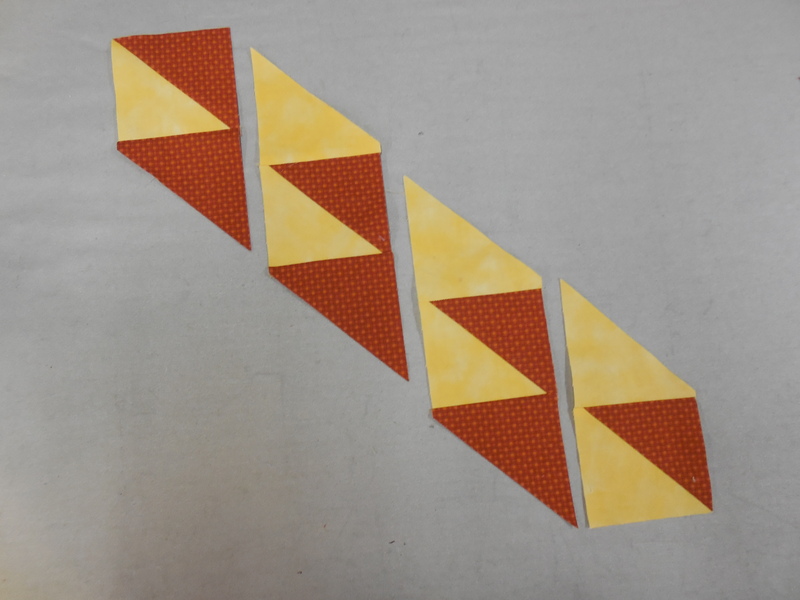 You will need 7 triangles, so you will have one of each fabric left over. **I tend to cut my squares a smidge larger and then trim them after I’ve assembled them. I then added the triangles to these HST units as shown below. 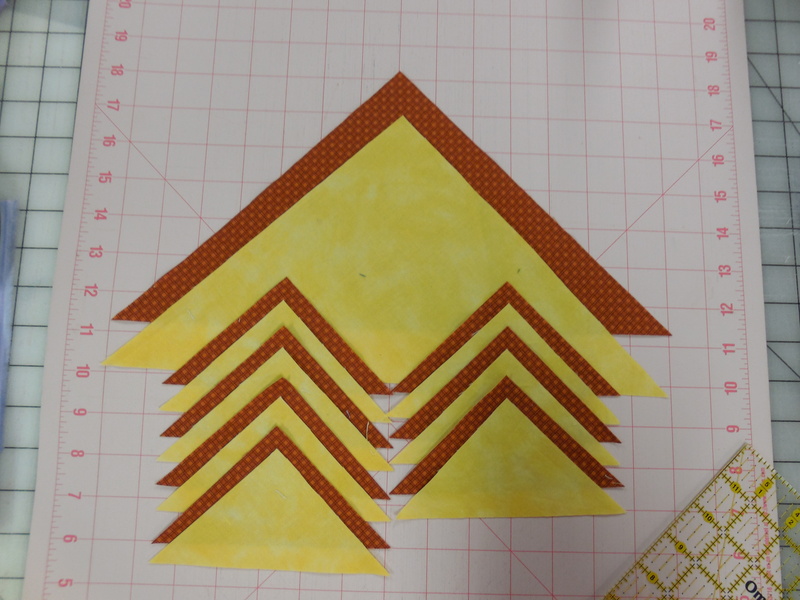 After adding the additional triangles I trimmed them even with the HST unit. Next begin piecing these units together matching the points as well as possible. 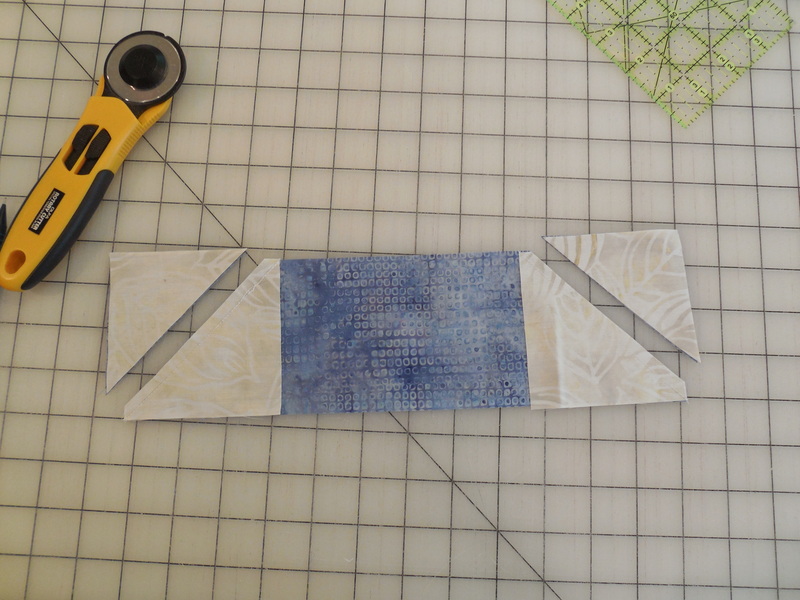 Once all four units are pieced together, you will sew the dark triangle to the side of the strip that has the light triangles. You will sew the light triangle to the other side. It should look something like this. I left mine untrimmed to give the winner of the blocks a little extra room to play if they need it. Welcome to China! If you missed the meeting last night you missed learning that our ever-important toilet paper was invented in China. However, only Emperors were able to own and use it. Sure glad that has changed! So our Block of the Month is the Chinese Lantern. You will make this block in June and bring it to the July meeting. 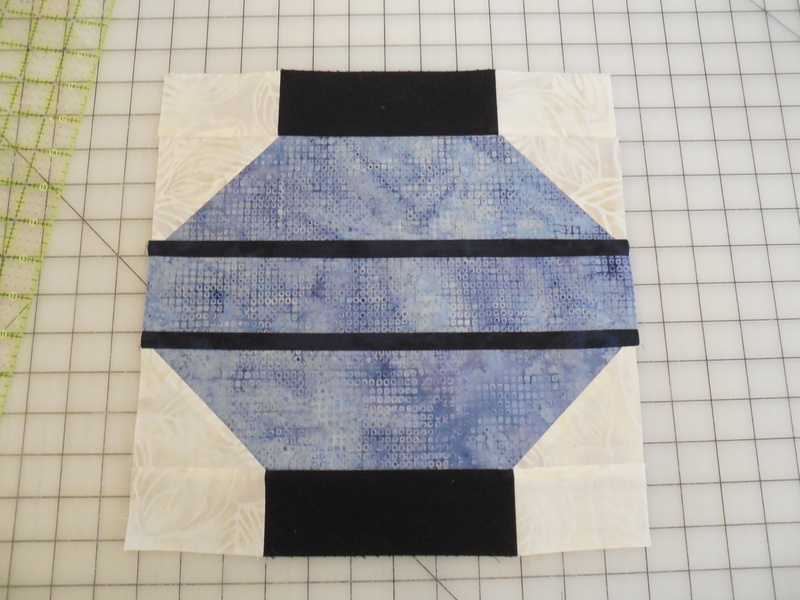 I really enjoyed making this block and think several of these blocks together in a quilt would be adorable. Our palette for this block will consist of a medium batik for the bulk of the lantern, a darker, coordinating batik for the two stripes in the middle. A pale or neutral (batik or solid) for the four corners and black (batik or solid) for the top and bottom of the lantern. 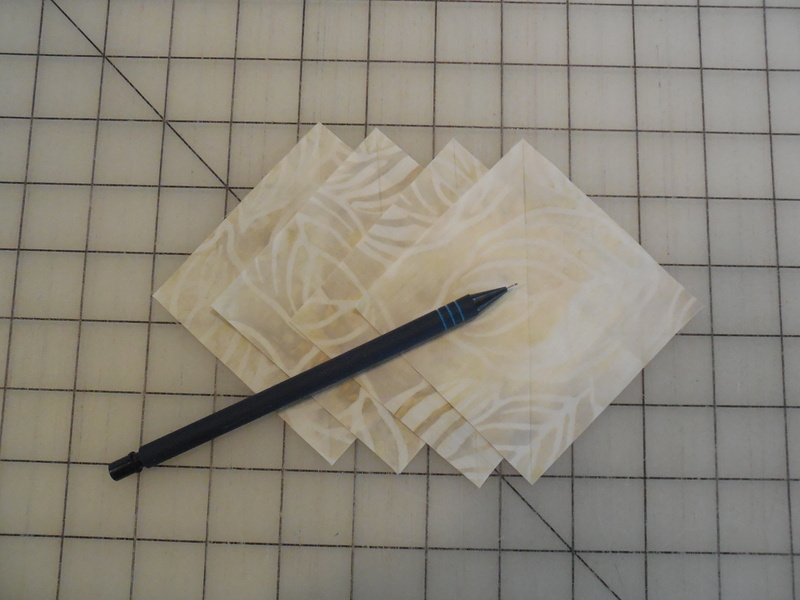 On each neutral square, draw a pencil line diagonally. 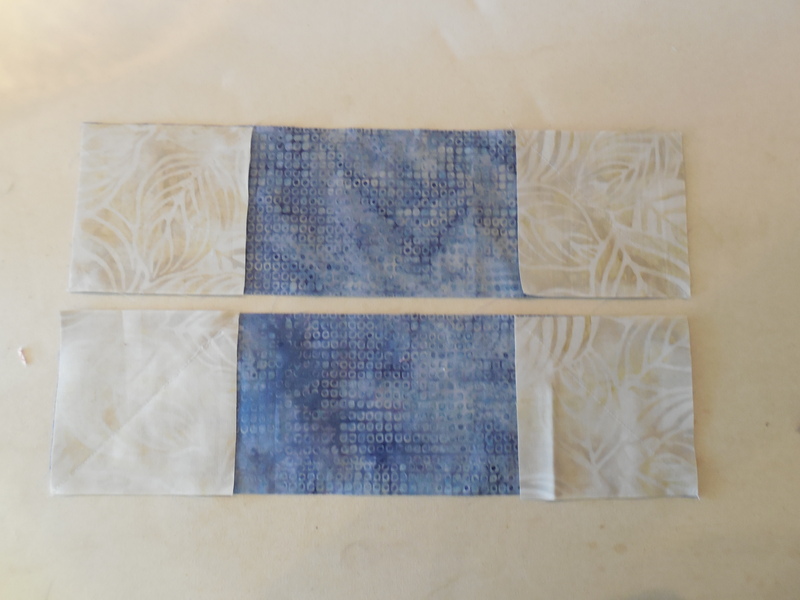 Place the squares on each side of both medium batik (3 1/2″) rectangles. Be sure the drawn lines are going in opposite directions. Sew ON the line and trim off the excess fabric. Assemble the center pieces together as shown below. Add the top and bottom and you will be finished! I hope you enjoy this block as much as I did! I buy a fair amount of specialty rulers and other gizmos that come out on the market. Most of the time they get used once, put into its place never to be seen again. Not so with this product from Quilt in a Day. I bought this ruler at least 2 years ago and finally used it last night! Our bee was putting next month’s BOM together (hint, hint) and this gave us the best result. It is the Small Flying Geese ruler. This ruler comes in several sizes. You can see them here: http://www.quiltinaday.com/search/default.asp?search=geese&x=11&y=3. I also have the mini set which I used a couple of weeks ago at my Dear Jane club that meets at The Fussy Cut in Beech Grove. 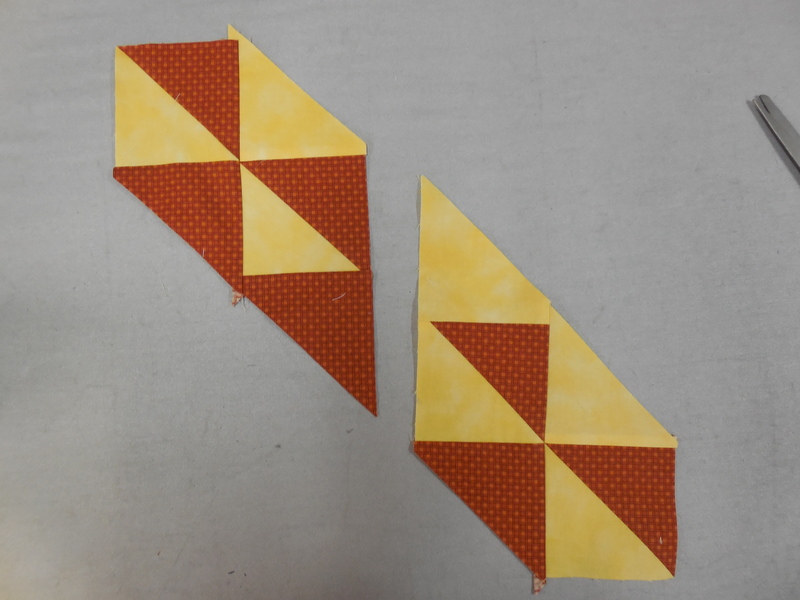 The directions are very clear and you end up with perfect flying geese blocks. I love this product! By the way, next month’s BOM will contain at least two 3″ x 6″ (finished size) flying geese units. 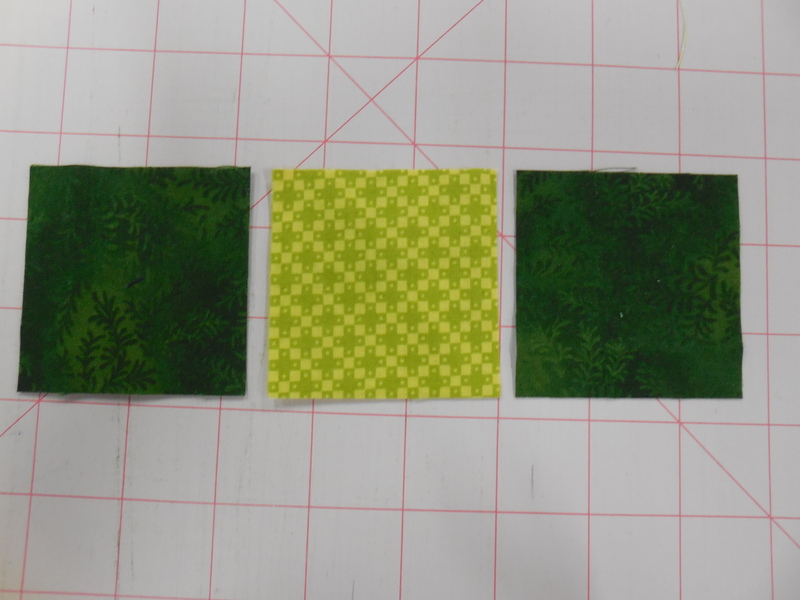 Please make this block with green and white fabric. 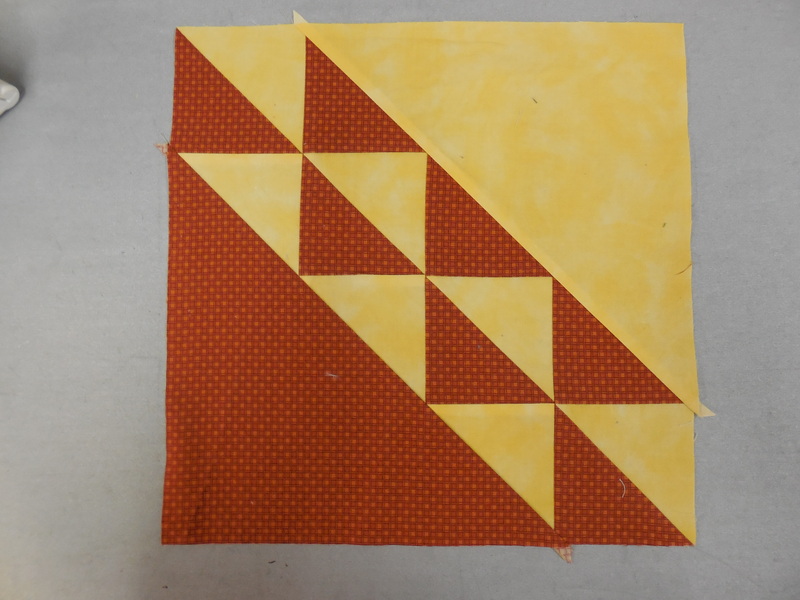 This block will be made in the month of March to bring to the April meeting. 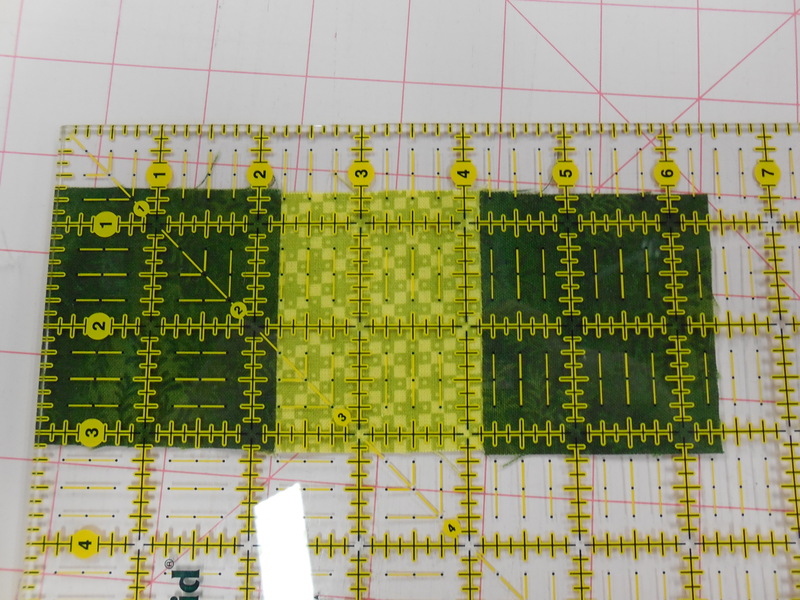 Your block should be 12 1/2″ x 12 1/2″ when you are finished. 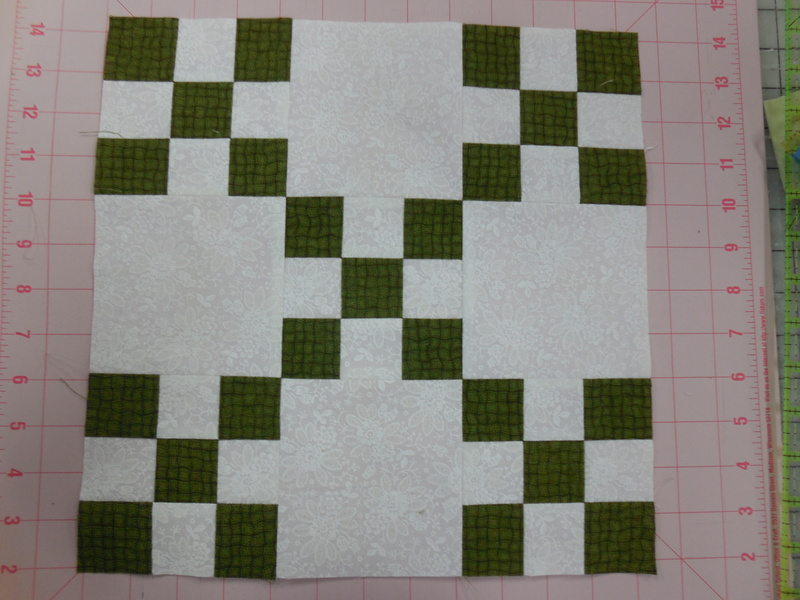 That will make a 12″ x 12″ block when it is put into a quilt. Sew the 20” strips together lengthwise putting the white strip in the center. 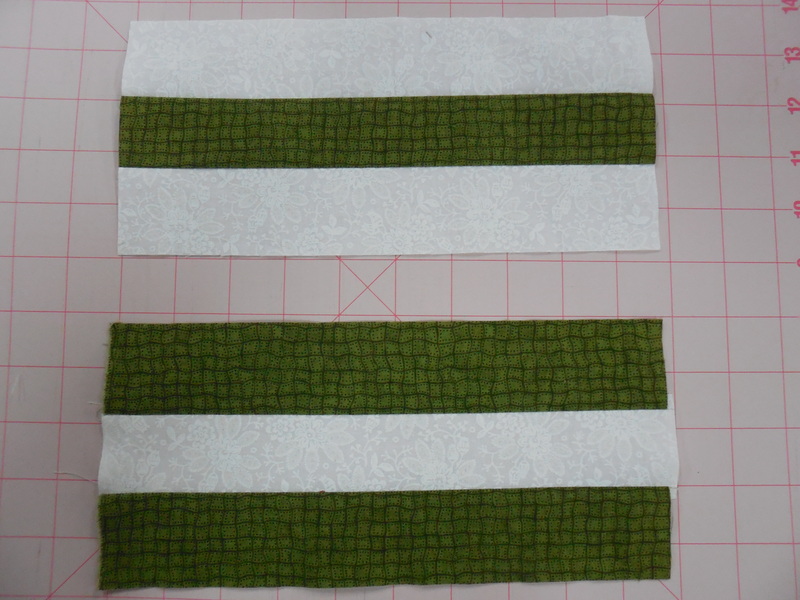 Sew the 10” strips together lengthwise putting the green strip in the center. 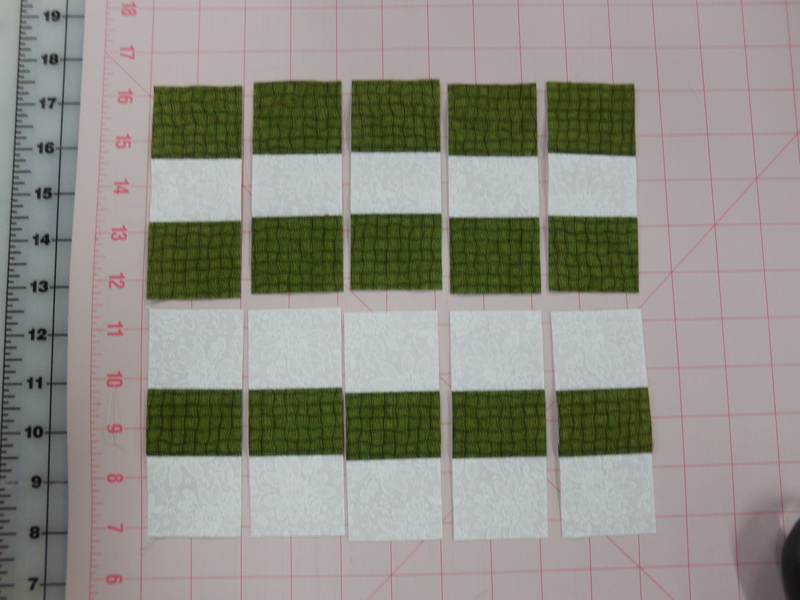 Lay out your units to make 5 nine patches and sew them together as shown. Several years ago my sister, Trisch, and I attended the AQS show in Nashville, TN. While there we had the opportunity to go to an event with Mary Ellen Hopkins as the main speaker. I had heard of her but not much more than that. I left that evening a fan. She was hilarious and inspiring. The one thing that has stuck with me all these years was her insistence at having your own PPM (Personal, Private Measurement). 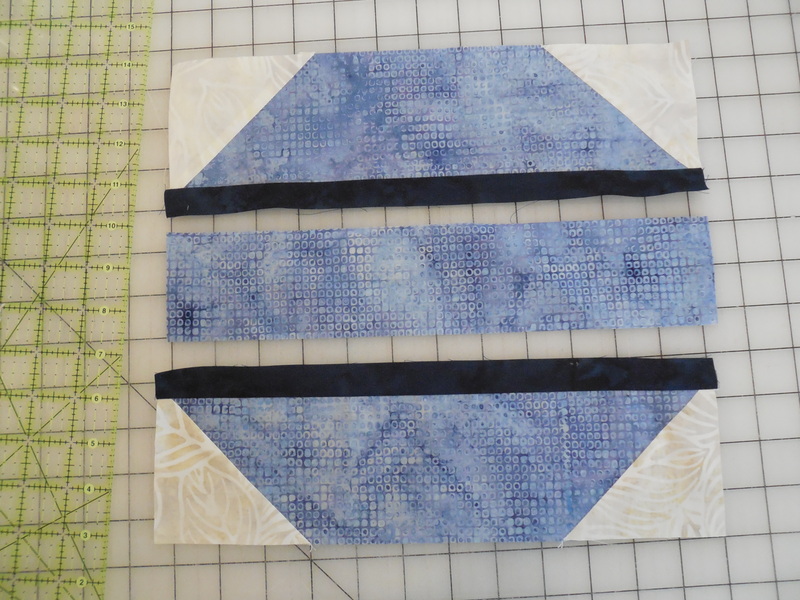 Her point was that an exact 1/4″ isn’t necessary as long as whatever measurement you use for seam allowances are the same throughout the quilt. I don’t disagree with the concept of a Private, Personal Measurement as long as it is in your Private, Personal Quilt. 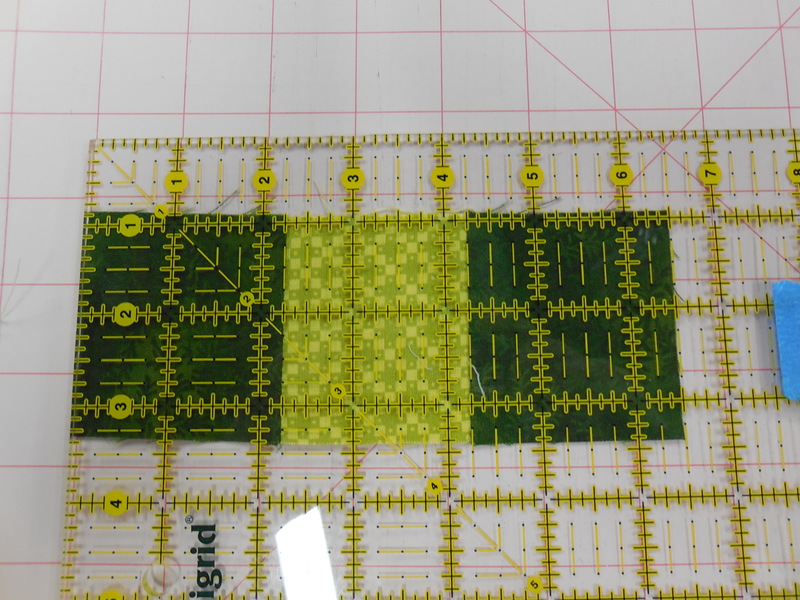 However, when you make blocks for a Public quilt there needs to be a standard and the industry standard is 1/4″. If we didn’t have a standard we would have blocks of all sizes. 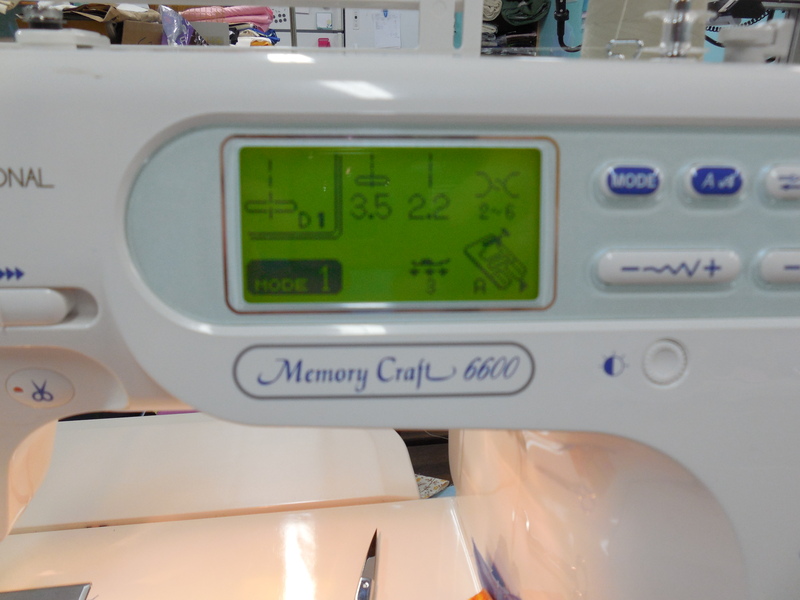 A seam allowance that is a few threads off is multiplied exponentially with each seam that is sewn. That being said, today’s post is about how to achieve that 1/4″ seam. Before you can fix something you have to know where the problem lies. That starts with your machine and a ruler. 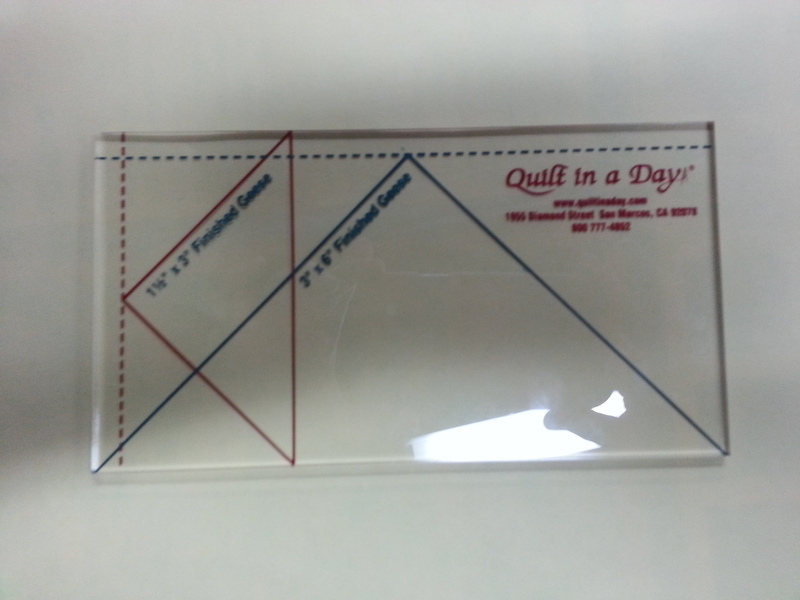 Use a ruler with clear markings and your 1/4″ foot. Lower your needle into the down position and measure the distance between the edge of your 1/4″ foot and the needle. It should be exactly 1/4″. My machine is not. When I turn on my machine the needle position is in the center at 3.5. The distance on my machine is more than 1/4″. My 1/4″ foot allows me to reposition my needle somewhat. I found that moving my needle position to 4.5 will give me a 1/4″ seam. But that isn’t enough. Now it is time to check the measurement in practice. 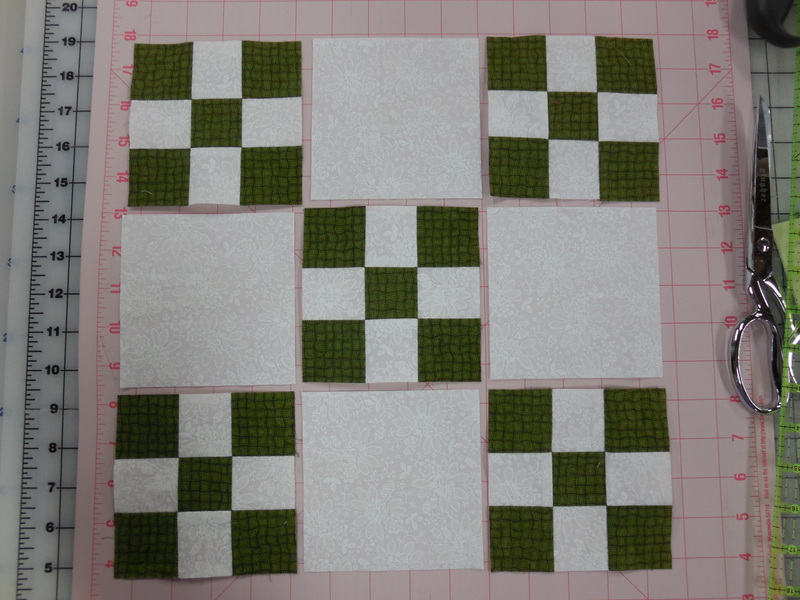 Start with three 2 1/2″ squares. 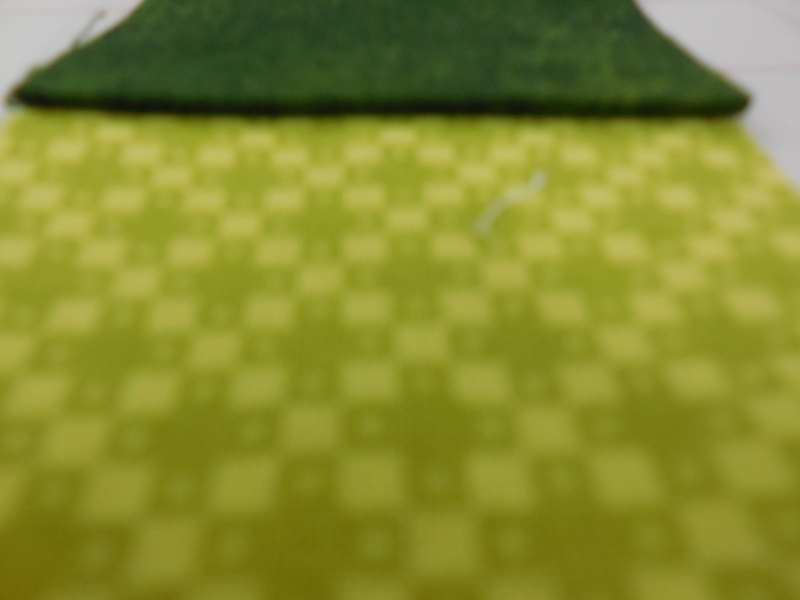 Sew them together using your newly found (or confirmed) 1/4″ seam. After pressing well you should have an exact measurement of 6 1/2″. As I said, it only takes being off by a couple of threads to make a huge difference. 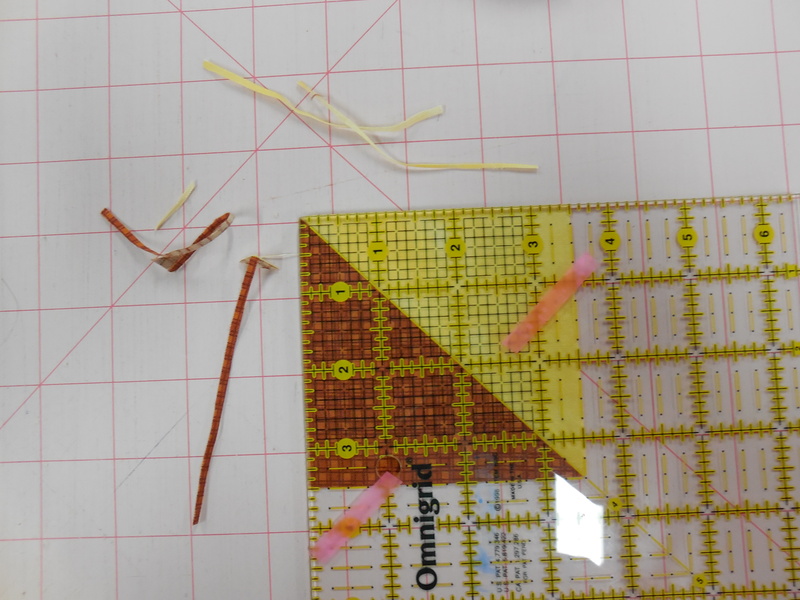 Below is a picture of the squares sewn together before making the needle position adjustment. See the difference? That is about 1/8″! Two more seams and it would be off an entire 1/4″. 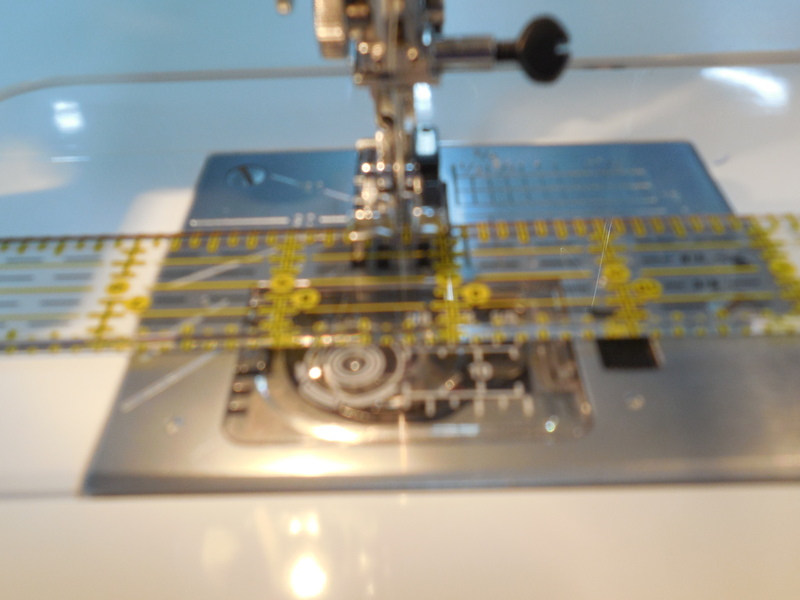 Not all machines or 1/4″ feet allow you to move your needle to make the adjustment. If that is the case, there is always the old standby of placing a piece of painters’ tape on the bed of your machine. But most importantly, however you make the adjustment double check it with the 3 square method. 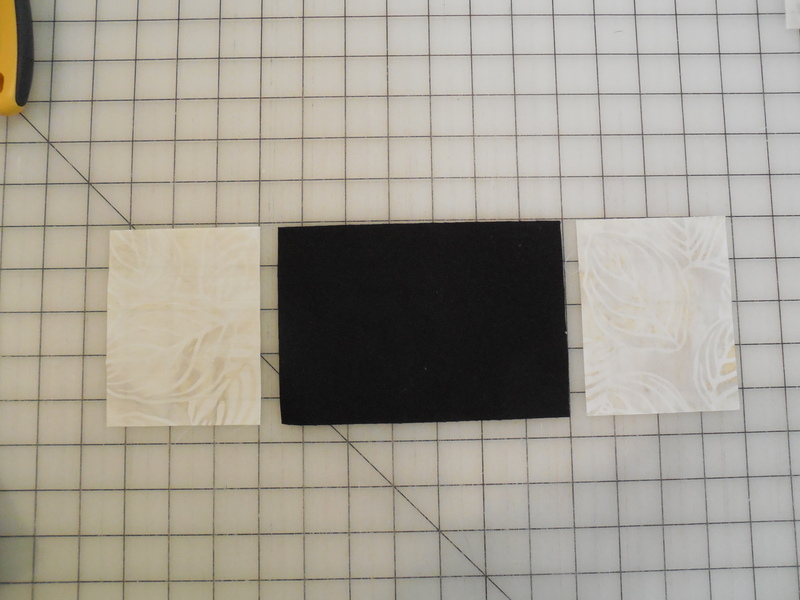 On another note…..I’ve seen some blocks end up too small because of a sad pressing job. If your seam isn’t fully extended when it is pressed that will also make a difference. You can see in the photos below that this seam has a small fold over the seam. Not only does that affect the size of your blocks it also creates extra bulk, which can lead to problems when you do your quilting. 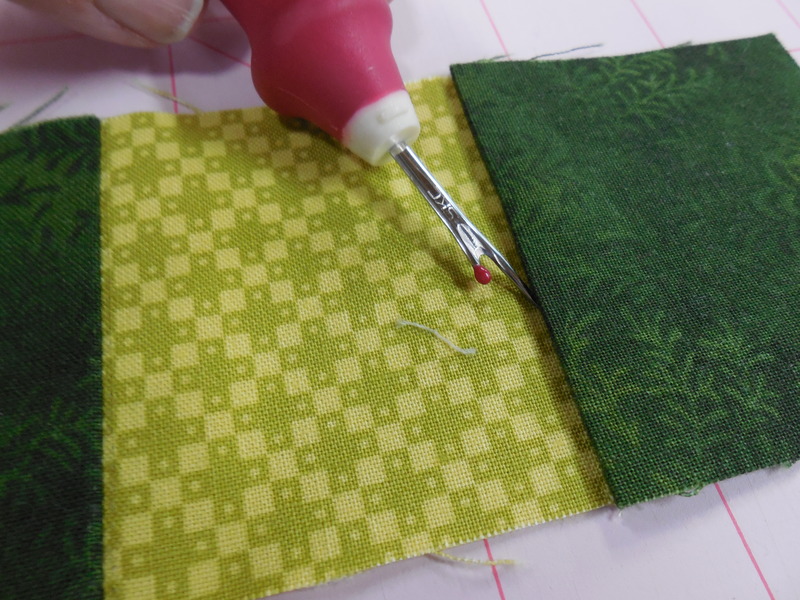 I’d like to challenge you to check your seam allowance using the 3 square method–you might be surprised!